This portal is dedicated to fish classified as above: Oscar fish. 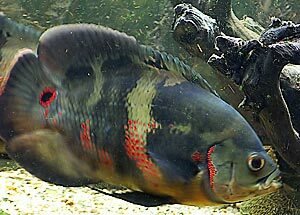 For some a night mare, that overgrew the tank and murdered all the residents, for the others an aquaristic fascination, compensating all the shortcomings with its behaviour and appearance. While analysing the fish name - "Astronotus Ocellatus" - we have got: "astrum" - a constellation; "notus" - marked; "Astronotus" - marked with a star (shining spot); "ocellatus" - an eye. When you have the aquarium ready, that is functioning long enough to "mature", it is time to look for the fish. It is quite easy to get Oscars, both young and full grown specimen, but you must remember they are not so common that you can buy them in every pet store. It is not a good idea to buy fish hastily. It is worthwhile to look for a variety we have chosen after hours of going through the pictures in front of the monitor. It is also necessary to look carefully at the fish we are buying to avoid unpleasant surprises in the future. 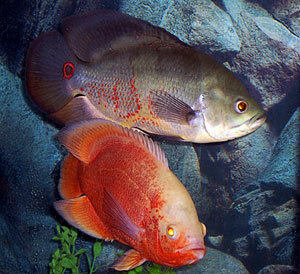 Some of the features which we have to keep in mind are common for both very young and adult fish. If a given feature is important or typical for a given age, it will be underlined in the text. Astronotus ocellatus can charm - both with their looks and behavior. It is easy to want them suddenly and irresistibly, but it is also essential to remember that we buy a living, and long (even 25 years) living animal. It is important to provide them with proper living conditions to avoid hard moments in our existence together. While planning the aquarium for Oscars we have to keep some of their features in mind: they are big (up to 35cm), they are dirty (according to their size, metabolism and architectonics aspirations) and fairly aggressive, especially in too small tanks, so their apartment MUST be big enough for their demanding. 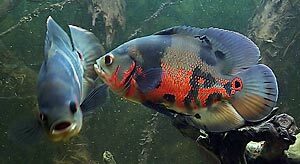 Trying to minimize their aquarium size usually finishes with disastrous quarrels among the fish or trouble with keeping water clear, being polluted by the fish too quickly. The capacities given here must be though treated as minimal. Those who start their adventure with Oscars are kindly asked not to lower them. Only those breeders who know a given specimen can risk such a thing. Exception to the rule is growing very young fish or a quarantine, but the immediate growth of the fish demands quick change of the tank. All the sayings that "A fish fits its size to the tank which it lives in" are invalid in case of Oscars. None of the breeders would like to have small, deformed fish. It is possible to grow them to full size in very small tanks, but such fish are exhausted with the lack of swimming space. Food, which we serve to our fish, its quantity and quality is one of the main factor that conditions their good health and growth. Oscar chichlid is not a fastidious fish and according to a general opinion it is enough for the fish to feed it with the aquarist's dinner remainings. One should not of course overdo, but mentioned convenience and large fish increases ensure a plenty of satisfaction. The first months of life are the most important ones for the fish. Then, its growth is quickest, and any failures during that period are extremely difficult to repair. Therefore an important question is a young fish selection for further breeding, described in the article "Let's buy some Oscars! ".